Trans-trax: Manchester as an air hub? To provide facilities to their passenger bases Air France and Lufthansa offer more and more services from Manchester into their main hubs. Especially now that there are large airline alliances these hubs include airports in different countries. Lufthansa, in the Star Alliance; has for many years been promoting Munich as a second hub and, no doubt, will do the same at Berlin when the new airport opens at Brandenburg in 2012. Its subsidiary airlines Swiss (Zürich), Austrian (Vienna) and Brussels Airlines (Brussels) provide more hubs for regional markets and directed at specific areas - e.g. Brussels concentrates on Africa. Alliance partners SAS covers Scandinavia and the Far East from Copenhagen while TAP´s principal routes are to Africa and Brazil from Lisbon. Air France, in the Skyteam alliance, has for many years had two airports in Paris with Orly and Le Bourget, the latter being later superceded by Charles-de-Gaulle at Roissy. Now there are to be substantial increases in flights from the regions at Bordeaux, Nice and Marseille, to add to the already operating hubs at Toulouse and Lyon. Air France´s other half, KLM, has a major hub at Amsterdam. However, the group´s cost cutting measures announced 13th January 2012 mean that some of the expansion will be put on hold or even cancelled. Alitalia, also Skyteam, has always had two focuses for travel with Rome (Ciampino and Fiumicino) and Milan (Linate and Malpensa). 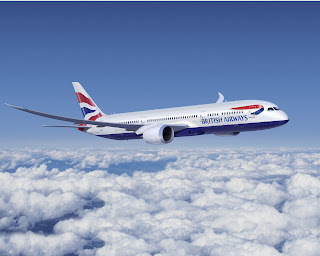 The oneworld Alliance has British Airways and Iberia (in the IAG group) as its two large European airlines. Iberia´s base is Madrid (which will shortly accomodate its "low cost" subsidiary Iberia Express) Affiliate airline "low cost" Vueling is based in Barcelona Prat but has already set up bases in Toulouse and Amsterdam. Iberia Regional - Air Nostrum is based in Valencia. Air Berlin(soon to join oneworld) has a large base in Palma de Mallorca. Another important member of oneworld is Finnair which flies out of Helsinki with the fastest connections to South Asia and the Far East. Air Berlin is concentrating on using Berlin Brandenburg and Düsseldorf as its hubs in Germany. Its subsidiaries Niki flies from Vienna while Belair flies from Zürich. 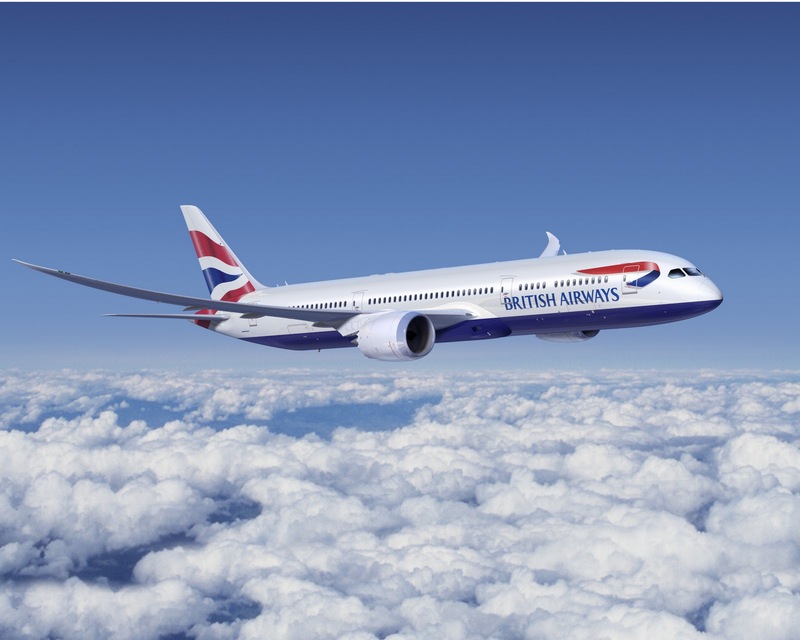 The BA side of IAG concentrates on London Heathrow Gatwick and City airports but nowhere else. Now that the British government has ruled out a third runway at Heathrow airport BA has decided it has to look elsewhere to expand including, but not exclusively, its partner´s (Iberia, in IAG) base in Madrid. There is an important point to consider. It is extremely difficult for an airline identified with a specific country, as all the legacy airlines are, to set up services in a foreign country to fly to a third. When airline services across the Atlantic were liberalised a few years ago just two attempts were made. On the agreement coming into effect Air France set up a direct flight from London Heathrow to Los Angeles. This did not last long and was subsequently withdrawn. The other attempt was by BA itself. It set up an all business airline called Open Skies (taking over a good French one in the process, called L´Avion) based at Paris Orly. It is still flying, just, but changed its COE in 2011. There were attempts to instigate services from Amsterdam to New York, which was abandoned, and later from Orly to Washington DC, also abandoned. Now it concentrates its services (twice daily) at Newark. You would expect businessmen to be less chauvinistic than other passengers, just looking for good service at reasonable prices. However, the project has not been the runaway success it expected. If that is the case with a specialized airline, what are the chances for BA outside Great Britain? If BA, thus, has its chances of expansion reduced abroad should it not look again to its home market? In this case there are five possibilities. Three are based on the component countries of the United Kingdom. Cardiff is too near London - the journey time from Cardiff to London Paddington by train is 2hrs. 5 mins. which will be reduced further by upcoming electrification of the line. Belfast, even though being on the other side of the Irish Sea only produces nearly 7.1 million ppa. (including the two Belfast and City of Derry airports). Scotland is a possibility to provide a base. However, here traffic is divided between Edinburgh 8.6 million ppa. and Glasgow (Abbotsinch and Prestwick) 8.2 million ppa. It should be noted that all these figures quoted are from the UK Civil Aviation Authority for 2010. Though it is attractive to fly into/from either of these cities it should be remembered that the effective population served lies in the central belt from Glasgow to Edinburgh which is reduced. The population of the WHOLE of Scotland is estimated in 2010 to be 5.22 million. Though the country might provide numbers for international services, they are not really enough to justify a full international hub airport. We are, thus, reduced to Birmingham and Manchester. While the former produced 8.57 million passengers through its airport in 2010 the latter produced 17.76 million passengers. Even if we consider the nearby airports to justify a hub, Manchester wins hands down. Birmingham can really only count on the traffic from East Midlands (4.11 million) and Bristol (5.75 million). To make a fair comparison Manchester would count on Liverpool (5.01 million) and Leeds/Bradford(2.76 million). Such comparisons are not strictly true as a lot of the passengers mentioned are leisure ones (sand and snow) who are really interested in travelling from their local airports to their fun destinations and not from an airport further away. However, the numbers do give an indication of traffic from a region. Birmingham is probably too close to London (about 100 miles) to generate a need to compete with the capital´s airports while Manchester is about double the distance. We should mention that in Manchester´s catchment area we have not included Blackpool (0.235 million), Humberside (0.283 million) nor Doncaster(0.876 million). The numbers sing their own praises. There is a greater demand for air transport from Manchester than from Birmingham. I have heard it said that Manchester cannot justify long haul international flights as its population is only 500,000. This is like saying that the Cities of London and Westminster cannot justify having international airports for the same reason - lack of population. This is,of course, rubbish. 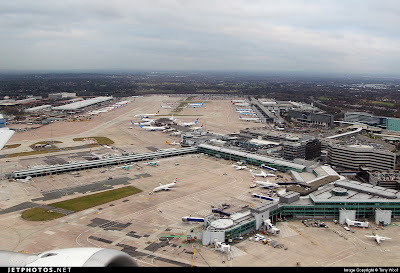 Manchester airport, itself, is owned by all the 10 metropolitan boroughs in the Metropolitan county of Greater Manchester which has a population of 2.63 million. However, one should not consider just the Metropolitan County. For long haul traffic Manchester airport can include in its catchment area, Cheshire (the airport already lies partly in the county) (1 million), Merseyside (1.37 million), Lancashire (1.45 million), West Yorkshire (2.16 million) and South Yorkshire(1.3 million). If you include the non-mentioned near and adjacent areas of Humberside, northern Derbyshire, the Potteries, Shropshire and North Wales then the catchment area easily passes the 11 million mark. This means the potential population is on a par with London, Paris and New York. These are more than enough reasons to consider the possibility of Manchester becoming a hub airport. 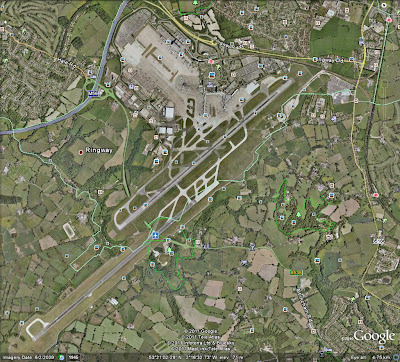 How many airports in Britain have two runways? The only ones of any importance are London Heathrow, Glasgow Prestwick, Edinburgh and Manchester. 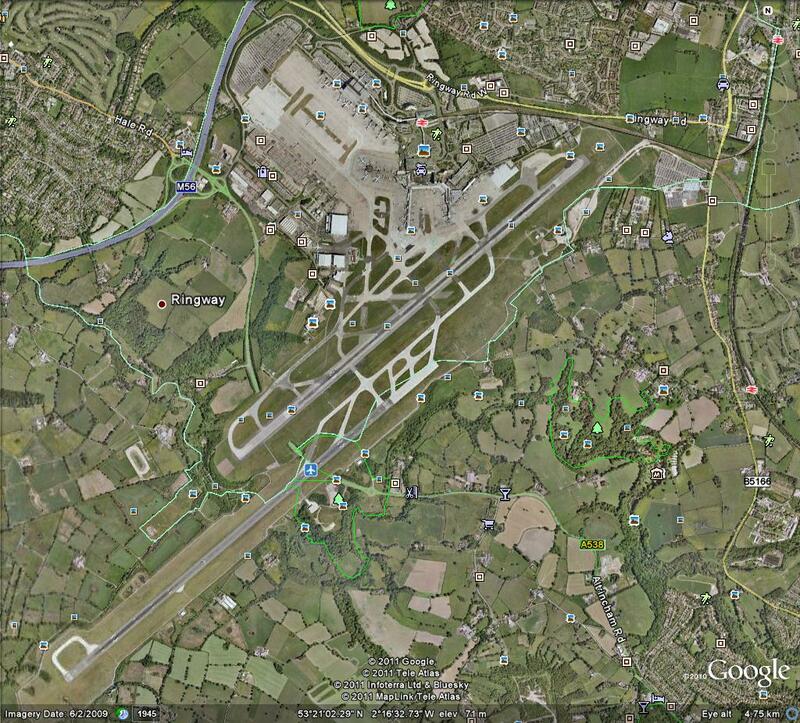 How many airports in Britain have two parallel runways? Only two - London Heathrow and Manchester International (originally known as Ringway). But what are the traffic patterns? As we have already said the main movements are to London, the three biggest European hub airports (Frankfurt, Amsterdam and Paris Charles-de-Gaulle) plus the Gulf airports of Doha, Abu Dhabi and Dubai. Does Manchester have local transport connections to/from the airport? These are already in place. There is a direct rail connection to Manchester Piccadilly and onwards to Preston and Scotland, as well as Leeds, York and Newcastle(to the north east), and Sheffield(to the south east). There are lots of local train services available. Thus the train services are well developed and can be considered to be better than those at the London airports. Liverpool 1 hr. 7 mins. These times are at present using diesel traction. Obviously, when the lines to Leeds and York, Liverpool, Preston and Blackpool are electrified, in the next few years, then line speeds will be greatly improved making rail a much more attractive means of transport. The Metrolink tram services from Manchester and district will be completed in 2016. These will be offering services every 12 mins. from Chorlton and Central Manchester. Long distance coach services serve the airport to many destinations to the four points of the compass.Local buses provide a well organised network to / from the airport. Roads: the M56 runs next to the airport which gives direct connection from Manchester to Chester and North Wales and the M6 (north -south artery) while it also joins the M60 circular motorway round Manchester which leads to the M62 and its connections to West Yorkshire and Liverpool. In a sentence the airport has two runways, a rail station connecting to points other than only Manchester, and flights to over 190 worldwide destinations. What is missing is an airline, be it BA, Virgin Atlantic or any other which decides it can make a profit flying out on long haul destinations from the airport. BA dropped its transatlantic flights some time ago, while it sold its European connections(BA Connect) to Flybe. BMI (now being bought by BA) flew transatlantic to New York(?) and Chicago for a few years but finally gave up. Virgin Atlantic still flies three long-haul routes, but only to leisure destinations, Orlando, Barbados and Las Vegas. and these are not counting the airlines and the destinations in Europe and the Mediterranean region. The best bet for expansion is with the three large airline alliances (Star Alliance, Skyteam or oneworld), Aer Lingus or Virgin Atlantic without looking at the already mentioned three Gulf airlines Etihad, Qatar and Emirates. The three Gulf airlines have been already mentioned, flying to each of their destinations up to three times daily for onward connections, through their home bases, to Asia, the Far East and Australasia. The Skyteam alliance (Air France and KLM plus Delta) already fly from Manchester to their hubs in Europe (Paris and Amsterdam) and the USA (Atlanta). The missing airline here is Alitalia. The Star Alliance is dominated by Lufthansa which flies 5 times daily to Frankfurt, but also (itself or through its subsidiary Germanwings) to Cologne, Düsseldorf, Hamburg, Munich and Stuttgart. Swiss flies to Basel and Zürich, while SAS flies to Copenhagen, Stockholm and Oslo. The US airlines United and US Airways fly to their hubs at Newark and Washington, and Philadelphia. Eastwards Singapore Airways flies to its home base through Munich. The major Star Alliance European airlines are all represented flying to their home bases. All these flights serve, of course, the interests of the members of those two Alliances. oneworld provides connections to Europe through its services with Finnair (Helsinki for the Far East) and BA SunAir (affiliate) to Billund(Denmark). Its US partner American Airlines flies to its hubs at Chicago and New York JFK. The BA Connect flights to Europe were sold to Flybe in 2007 for a 15% stake in the company. The problem resides in the fact that Flybe provides connecting services for Air France as well as BA. What remains are codeshare flights, with Flybe, but only from Manchester to Milan, Hannover and Düsseldorf - not a lot of baggage. Iberia has also restarted flights to Madrid after an absence of a few years. In short the oneworld alliance provides very little service at all. As has been said before there are various possibilities , but let us start with oneworld (meaning British Airways). Before we think about any expansion of services by BA we have to ensure that the possibilities of connections for a greater number of passengers into and out from M/C to/from Europe are maximalised. Firstly, BA´s affiliate SunAir should work harder to provide connections from Copenhagen, Oslo, Gothenburg and Stockholm, with Hamburg as a possible addition, as well as the present Billund. If Flybe is BA´s associate airline (with its 15% shareholding) then Flybe´s flights to Brussels, Paris CDG and other French destinations should be BA codeshares to also provide input. Its other German destinations of Frankfurt and Stuttgart and possibly Hamburg and Berlin could provide input services. Amsterdam, Geneva and other Italian cities(unserved at present) could provide connections also. In fact all Flybe flights could codeshare with BA. Flybe has an extensive network from Manchester to 12 British Isles destinations - all with the possibility of providing codeshare routes. BA only flies to Heathrow and Gatwick. BA´s takeover of BMI means competition is being taken out of the market. However, BMI´s three routes from M/C (to Aberdeen, Edinburgh and Heathrow ) are run by BMI Regional which BA does not want - more than likely the competition authorities would force BA to sell this unit anyway. In the article by Reuters "BMI facing breakup in battle for Heathrow"(18 October 2011) part of the problem is explained. In this article on the BBC "A New Scottish Airline" (25 October 2011) they give a hint as to possible buyers of BMI Regional. The first poster on this BusinessTraveller Forum "bmi Regional to be sold" (28 October 2011) gives some more insight to the solution for the company. However, BA has everything going for it, if it wants. It can use codeshares with its associate airline Flybe, or with its franchisee, BA SunAir, or with its oneworld partners,Iberia, Finnair and Air Berlin. That way the feed into a long-haul network is assured. Around which destinations would a long haul network be established? AA already flies to New York JFK and Chicago. Flights to Delhi and Mumbai would connect to the Kingfisher network while providing for the British Indian population travelling to the subcontinent. Hong Kong (Cathay Pacific and Qantas), Tokyo (JAL), Kuala Lumpur (Malaysia), Singapore and Bangkok(Qantas) Moscow (S7) are all obvious choices, immediately or mid-term, to connect to oneworld partners. But which of the oneworld partners should provide the connection?Obviously, if each and every airline mentioned in the previous paragraph flew into Manchester, then BA would not have the need to provide such flights, just codeshare. We know that is not going to happen. For an airline to establish a presence at a destination its incurrs a great expense. Not least is the need to have personnel (ground and flight crew) away from their home base. That is the reason that BA found operations at Manchester too expensive in the past. If, however, a critical mass were found that made operations from Manchester viable with locally based crew - be them short, medium or long haul - then we are sure that operations could more than viable. In fact the recent labour problems with crew have been to ensure that there is enough flexibility to assign them to short or long haul operations - the so called "mixed crew". This means that the possibilities for BA to establish operations at Manchester from now on are greatly enhanced - if it wants. This would be in contrast to the operations before from Manchester when everything was run from London (including the crews), meaning overnight expenses at least. Virgin Atlantic(VAt) is another airline with the possibility of opening more operations from Manchester. It has an established network in North America (including the Caribbean), Africa and Asia. Establishing extra flights to distant destinations means very little extra expense as it already has the personnel at the distant airport and country. In fact, more flights would help economies of scale. "Joining the dots" as this is called is a favourite tactic of the "low cost" operators to expand at minimal cost. Since VAt flies mostly across the Atlantic it could easily connect to Virgin America (VAm) via New York (JFK), Boston, Washington D.C., Chicago, Orlando, San Francisco, Las Vegas, and Los Angeles. Other destinations such as Miami and Cancun offer more possibilities as do others in the Caribbean. If VAt joined the Star Alliance (a distinct possibility) then with its partners such as South African, United Continental, US Airways,Air Canada, Singapore, ANA, already operating from VAt destinations then the possibilities are opened wide. The sticking point is Europe. The Star Alliance destinations offered into Manchester are quite extensive but would the partners agree to a downgrade in the number of passengers through their own hubs? I think they would be very reticent. The takeover of BMI by BA also worsens things for Virgin Atlantic. As its feed partner it will be left with no connections, so no infeed of passengers. The conclusion is that VAt would have to sort out its European connections so as to provide sufficient input to its intercontinental flights so as to make them viable. 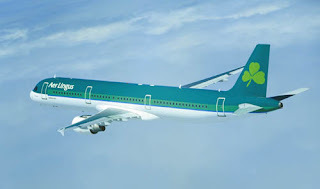 The third possibility mentioned is Aer Lingus. In the 1960s, with the introduction of jet aircraft, Aer Lingus developed a feeder network from Continental Europe to Dublin via Manchester. this way Manchester had its first jet connections with mainland Europe in competition with British European Airways(BEA) as BA then was. This was very successful for the airline and with the public. The services now on offer through Dublin westwards are to New York JFK, Boston and Chicago - all with a strong Irish diaspora. From its bases in Ireland it looks eastwards and southwards more to the leisure market destinations, like a charter airline. This where Aer Lingus can perhaps increase its presence. It did try flying to Dubai for a time (some months?) but that was not so successful so it pulled out. We know that Aer Lingus is looking again at joining an airline alliance. However, with whom is not clear. Previously it was in oneworld but its return is no done deal as yet. Here maybe Virgin Atlantic can gain something for mutual benefit. Aer Lingus already has the short haul European network which maybe could be extended into Manchester. VAt already has its own long haul destinations and through them its connections to its Virgin relatives America and Australia(VAu). Is there not a marriage in the making, especially if you consider VAt ´s major shareholder, Singapore(SIA) and VAu´s partner Etihad? What additional flights could be offered from Manchester? Though VAt ´s flights from the airport are leisure destinations what any interested party wants, whether it be VAt or BA or whoever, are flights with a strong element of business interest. This way the likelyhood of making money through Business Class sales is much greater and much more appealing. "Routesonline" has a list of "unserved" and "underserved" routes from Manchester, which appear to have been last updated in February 2009, while the news was last updated in May 2010. In the Routes TV section there is an interview with two Aviation Sales Directors from Manchester airport who talk about plans for expansion globally. Now it just needs some airline to take up the challenge. That way the pressure on the South East of England can be reduced.